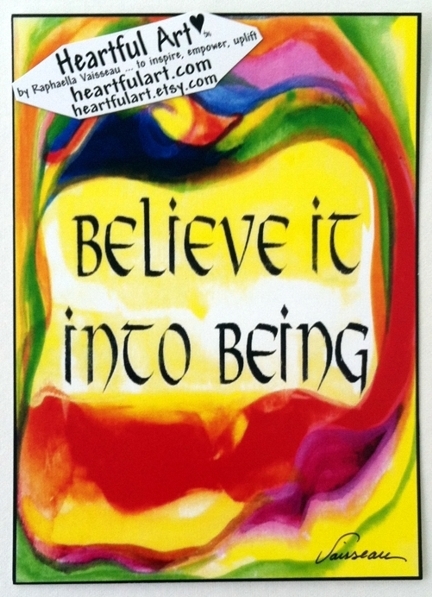 5x7 New Thought poster "BELIEVE IT INTO BEING" with colorful art by Raphaella Vaisseau is a motivational reminder to believe in yourself, imagine your life the way you want it, and know that you can realize your dreams. The Law of Attraction teaches that the power of your belief and effectiveness of your emotional vibration (feelings) will result in the manifestation of your desire. Belief and desire are two essential ingredients of manifestation. See yourself already there. Feel it. Believe it. Be it.